Jim Stevenson, a native of Texas, received a BFA from Sam Houston State University and studied at the New York Academy of Art and with noted figurative painter Greg Decker. Jim lived in New York City for 10 years and now lives in Rhinebeck, NY, where he draws inspiration from the scenery and people of the beautiful Hudson Valley. Jim is an oil painter of landscapes, animals, people, and abstracts. His work fuses traditional methods with contemporary perception. Constantly delighted by the forms of nature and the human figure, his work is a crystallization of these experiences. Jim describes his work as a search for the beauty and mystery of the everyday world. Jim works with recognizable imagery – landscape, portrait, still-life – but his work is more abstract than it might at first appear. 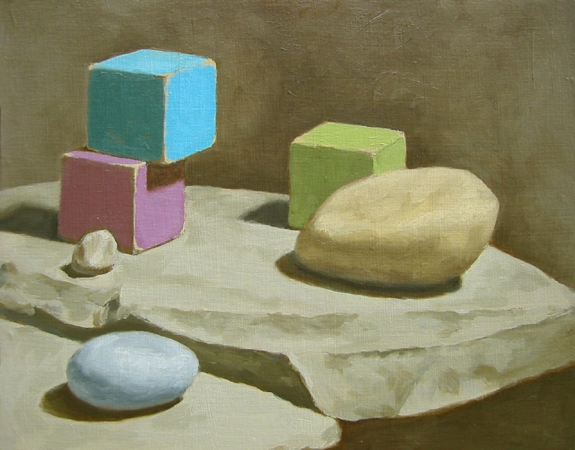 Composition and color relationships occupy much of his thought process while painting. While the old masters and 19th century European artists are a significant and obvious source of inspiration, he also draws significantly on the lessons of the post-impressionists, early modernists and abstract expressionists. The nuances of color passages and color spaces hold a particular fascination for Jim, and provide an endless field for exploration in the seemingly simple spaces of his paintings. "Seeing the extraordinary in the ordinary.... Often repeated as a truism in painting -- but in the work of Jim Stevenson this simple maxim takes on richness, subtlety and power. Jim is a painter of the everyday: cows in a field, a family of pears, discarded objects; but he is not an everyday painter. The drawing is solid and searching, the coloration sensual and luminous. Even odd at times, the color: a complicity of mute purples, smoky greens and earth yellows carefully built up into luminous form. In the landscapes of the last two years there is a sense of the primal and the mystic in the light and the land. (After all, he does paint in the Hudson Valley)."